Order of the Bath » What’s the game? I first saw one of these adverts at the beginning of the summer. It was scrawled onto a piece of cardboard torn from a box and tied to a lamp-post with string and I thought “they have got to be kidding”. Since then this slightly smarter one has appeared in a similar place and now I have seen a more detailed one stuck to the door of a car which adds “Up to full market value paid. Fast, reliable service. No agent fees.”. 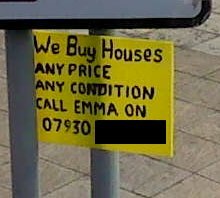 Is this some sort of scam or is it they just don’t like estate agents? At a guess I would say they they were exploiting people who are having trouble meeting their mortgage but I will be glad to be reassured that they are above board. This entry was posted on 2 Sep 2011 at 17:05	by Rick	and is filed under Miscellaneous. You can follow any responses to this entry through the RSS 2.0 feed. Both comments and pings are currently closed. My feeling is it’s totally legal but probably not above board. Have you seen the following circular that’s doing the rounds in Penzance and St Just? A bit nasty in its tone, perhaps, but still very funny! This is a circular to agents and businesses in the St Just and Penzance areas. Please circulate if possible. P A Wilkins and Company have won a prize for the quality of their marketing material. The judges are fully aware that semi-literacy is the norm among estate agents, and not only in areas were freemasonic cockiness (“we make money doing what we’ve always done”) is the most rife. But there was unanimous agreement that P A Wilkins and Company have performed marvellously in scraping the very bottom of the barrel. The prize is receipt of the coveted Semi-Literate Morons of the Year Award 2011, to be awarded at the Provincial Grand Lodge of Cornwall by the Provincial Grand Master. Nice one – thanks for pointing it out, I wouldn’t have seen it otherwise.